I feel like I might have had this on vinyl another lifetime ago but that may have just been a dream. Nonetheless, I loved this album when it was released and am glad to hear you call it a classic. I think it still stands up. A lot better than anything Aerosmith’s done lately, anyway! You must be getting close to the whole Aero catalogue reviewed Mike, well done! Did I mention yesterday Vallance had a good resume?! And yes I’m close. I have a couple live albums I haven’t done (one I don’t even own). For studio albums, I have to do Just Push Play and Honkin’ on Bobo. I think that’s about it. That’s terrific, are you close to the full catalogue reviewed for any other artist? Some artists I’ve done completely: Kiss, Iron Maiden, Ace Frehley, and Bruce Dickinson. I believe I have one Van Hagar live album to review, and then I’m done with Halen! But I don’t think I’m really close with anybody else. Aerosmith and Halen. And those kiss and maiden catalogues aren’t exactly small ones, well done! Kiss was over 50 parts long! Great write-up, Mike! I’ve always thought this was one of ‘those’ albums, but have never heard it start to finish. Very familiar with a couple of songs, right enough. Seems like I might be missing out … I kinda want this now. I think you better give it a listen man. Album tracks are superior to the singles! I’m gonna not read this one until I hear the whole thing myself. I think this is the one I got for $1. Still need to play it! I know the hits, of course… anyway, bookmarked for later! Fair enough dude, for a buck that’s a no-brainer! 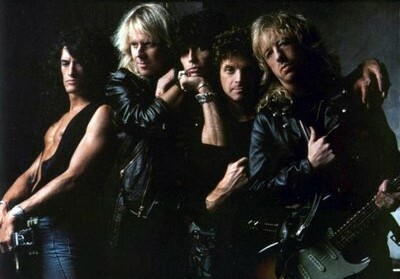 “Pump” was Aerosmith reborn for sure! I’ll go out on a limb and say it was the “Toys in the Attic” of the 80s. Nice review. Toys of the 80’s. That works for me! Cheers! Yup a classic and this is a Dud Free Aero Album…Dug Get A Grip (esp the first four tracks ) and Nine Lives and than the band came undone…..
Nine Lives was the last one that I legit really dug. Not perfect but maintaining a certain level before the plane crashed into the damned mountain. But another great review and absolutely agree this was an absolute classic. While appreciate their heyday this was indeed their best second crack of the whip, great album very fitting of its time but open armed for today. Cool review Mike, say it every time too but after seeimg these pics a thoisand times yer scans and additions such great eye candy bringimg these reviews to life. Love ya work. Thank you sir! I wish I had better lighting and more space to do proper photos. But I do the best with what I got! Yes! That’s what I should have said. That’s it exactly. Kids are going to get drunk whether Joe Perry is or not!